Coffee Buzz Part 2 – Concerns? We just posted an article on the benefits of coffee. Here we’ll be reconsidering a few of things we’ve learned to be concerned about regarding coffee. More good news! You may have heard of some studies claiming that consuming coffee has been associated with negative health effects. While I won’t argue that these studies have produced negative results, I feel it’s important to examine the mechanisms behind the research and consider how the protocols differ from real-world coffee consumption. For instance, many of the concerns regarding coffee come from studies during which high doses of caffeine are ingested in a short period of time – significantly higher doses than would be consumed in a normal morning cup of coffee. Also, some research claims to study the effects of coffee on our bodies, but the results – argued as “negative effects of coffee” – can also be viewed as the typical negative effects of low blood sugar. In other words, drinking a cup of black coffee first thing in the morning isn’t going to be good for you no matter what, and it has very little to do with the presence of caffeine (though, as a stimulant, caffeine may intensify the experience). If you’re familiar with Tracie’s work, you’ll recognize these results as typical effects of low blood sugar that lead to the release of stress hormones, rather than a unique issue caused by caffeine or coffee. These effects include an increase in body temperature and a heightened metabolic rate. Blaming these things on coffee seems a little unfair, since if you’re not eating a balance of protein and carbohydrate in the morning in any form, you’ll see those results. On the other hand, it’s also good to keep in mind the importance of maintaining balanced blood sugar at all times, but especially first thing in the morning. For some time now, obstetricians have recommended cutting back on caffeine during pregnancy. Some practitioners claim caffeine during pregnancy can cause birth defects and miscarriages, or stunt the growth of a fetus. However, a study conducted by the Congenital Malformations Registry at the New York State Department of Health (using data supplied by the National Birth Defects Prevention Study [NBDPS]), showed that there was no convincing evidence of an association between maternal caffeine intake and the birth defects included in the study. Other studies using animals at the Thomas Jefferson University at the DuPont Hospital for Children concluded that the research does not support the idea that moderate to even high amounts of caffeine increase the risks of congenital malformations, miscarriage or growth retardation. Please note that we are not telling you to drink tons of coffee during a pregnancy. However, it seems clear that shunning caffeine isn’t necessary. 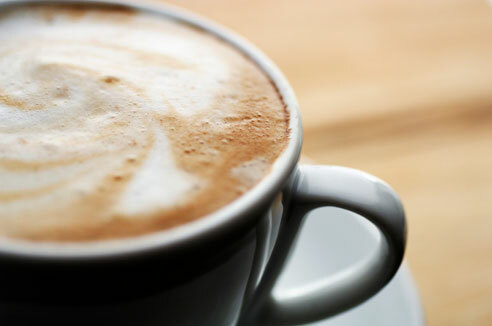 Some studies and news reports have indicated that caffeine and/or coffee causes fibrocystic breast cancer. Introduced by J.P. Minton of Ohio State University in a series of published articles, the theory points to an increase in cyclic AMP (a regulatory substance associated with normal cellular function) when breast disease is present, and a direct relationship between the rise of cyclic AMP and the rise of disease. In the study, Minton made a connection between the rise of cyclic AMP and caffeine, and concluded that a) the rise in cyclic AMP is a bad thing and causes disease, and b) since caffeine seems to increase cyclic AMP, then caffeine must also contribute to or even cause cancer. Dr. Raymond Peat refutes this claim in his article Caffeine: A Vitamin-like Nutrient, or Adaptogen? Dr. Peat explains that the presence of higher cyclic AMP in a diseased breast is actually a marker of the body trying to fight the disease. The rise of cyclic AMP as disease increases is reflective of the body’s attempt to fight the disease by increasing production of cyclic AMP. Peat agrees that caffeine affects the production of cyclic AMP – but in his estimation, this is a good thing. Caffeine actually inhibits the growth of cancer cells by stimulating production of cyclic AMP. Peat goes on to explain that Minton would have been better off suggesting to increase the amount of caffeine (i.e.., coffee) in relation to the degree of disease in the breast. There have been studies indicating coffee increases blood pressure, but these increases are slight to moderate. In relation to other factors involved in blood pressure, this one long-term variable has been inconclusive in studies. There are other substances that cause blood pressure to rise – low blood sugar, for example, can cause adrenaline to increase and negatively affect your blood pressure. Hence, we don’t believe this is a compelling reason to avoid coffee, particularly given its benefits (though, again, it should be ingested appropriately and as part of an overall healthy, balanced diet). Have you heard that coffee stains your teeth? This is mainly due to coffee’s acidic nature. If this is a concern of yours, you can add a pinch of baking soda to neutralize it, though milk and cream will buffer the acidity as well. At the end of the day, your health is your responsibility and you need to make the best decisions regarding your lifestyle, nutritional needs and concerns. If you love coffee and drink it every day, I hope these posts will put some concerns you may have had to rest. If you’re still skeptical, I hope you’ll consider doing your own research so you have the best information at your fingertips. Browne, M., Hoyt, A., Feldkamp, M., Rasmussen, S., Marshall, E., Druschel, C., et al. (2011). Maternal caffeine intake and risk of selected birth defects in the National Birth Defects Prevention Study. Birth Defects Res A Clin Mol Teratol , Feb;91(2):93-101. Thank you for your comments on both the positives and the negatives on coffee consumption, very informative. As you said very well, at the end of the day, it is up to us, the consumer, to make the decision. Doctors, dieticians, and other health care providers are well meaning, but nothing can replace one’s own research, especially when it is not known just now well read those health care providers are. Not always necessary to throw the baby out with the bath water. Again, thank you for your information. Thanks for reading Sharon and the kind words. I agree with your statement about health care providers. I have a great deal of respect for these individuals and their intentions are good. At the end of the day I feel people need to take the time and look deep into the literature and come up with their own conclusions and do what feels right for them and their bodies.